Chinese New Year is coming and it wouldn’t be the same without the cookies we know so well that make up part of the Chinese New Year mood. Baking Kuih Bangkit reminds me of my childhood when I got to help my late grand-mother to make it after school. This is one of her signature Chinese New Year cookies. Unfortunately, I did not take down her recipe. I did remember a little here and there and I incorporated what I remembered using a recipe from Nyonya Flavours. The main culprit of unsuccessful Kuih Bangkit is the presence of water in coconut milk and flour. If the flour isn't dry enough, the Kuih Bangkit will neither crumble nor melt in the mouth. The presence of water will result in a hard cookie. You may also dry roast the tapioca flour in the dry wok over a low heat to ensure there is no moisture in the flour. But I am lazy and I found that baking the raw flour will yield the same result. It is also critical to ensure that no water is added when the coconut milk is extracted from the grated coconut. To be safe I would buy the grated coconut and extract it myself. The original recipe is with 1 grated coconut. But, to be safe I bought 2 grated coconuts. My hubby helped me to extract the coconut milk. I must say that this recipe is very successful and the Kuih Bangkit will just crumble and melt in the mouth the way it is meant to. Transfer tapioca flour into the flat baking pan and tuck pandan leaves in. Bake at 160°C to 170°C for 1 hour and 20 minutes. Remove pandan leave and keep flour in the plastic bag after completely cool. The best is keep overnight before using. Sift the tapioca flour into the mixing bowl. Whisk the egg and sugar until very thick and stir in 250ml of coconut milk gradually. Then knead in enough flour to form a soft pliable dough, about 5 minutes. You may not use all the flour. Lightly dust a wooden/plastic Kuih Bangkit mould with the remaining flour. 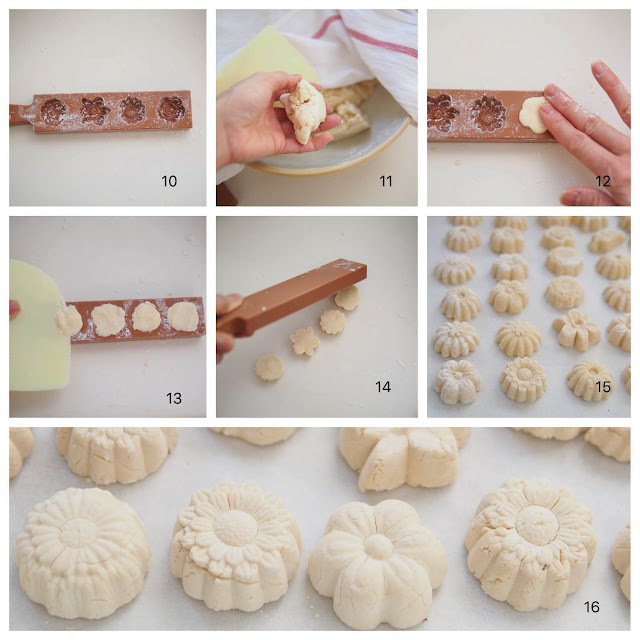 Press a small piece of dough into each on the mould, trim off excess dough with a butter knife and knock the mould gently against the worktop to dislodge the cookies. 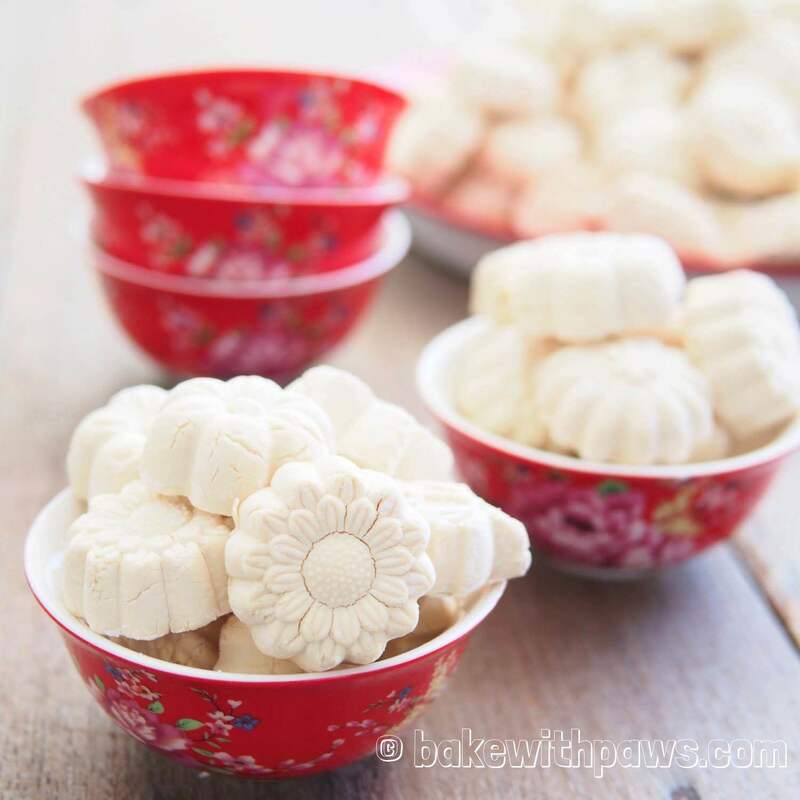 Arrange the Kuih Bangkit on lightly floured baking trays. Bake at 160C for 10-20 minutes. 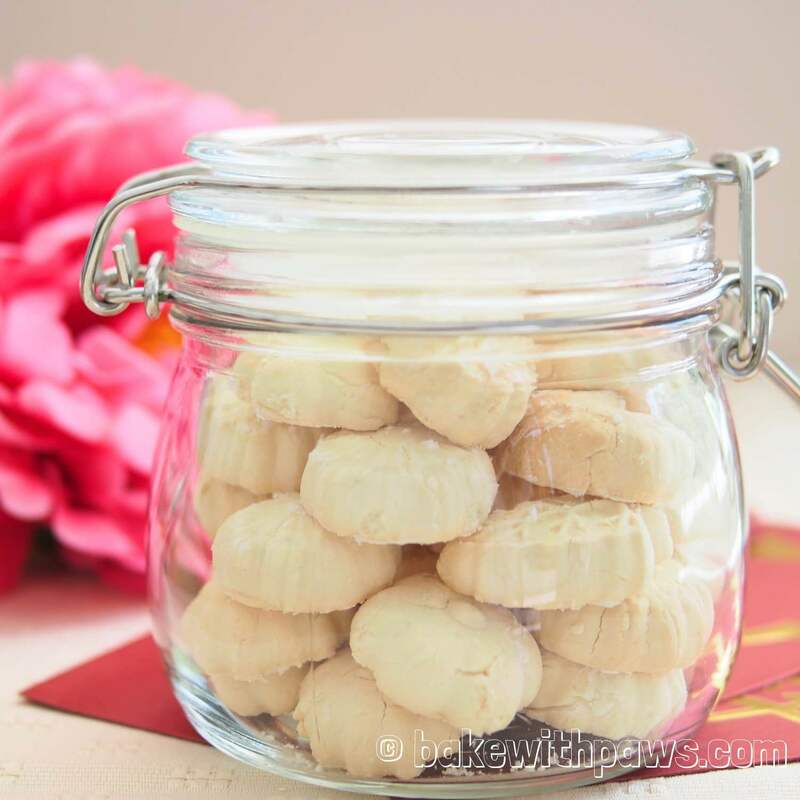 If a pale white Kuih Bangkit is preferred, remove cookies after 15 minutes. If a more aromatic and crisp cookies is the preference, bake it until just very lightly browned. Cool them and store in air-tight jars. I have been making Kuih Bangkit every Chinew New Year since 2014. I understand the main culprit of unsuccessful Kuih Bangkit like I have mentioned above. 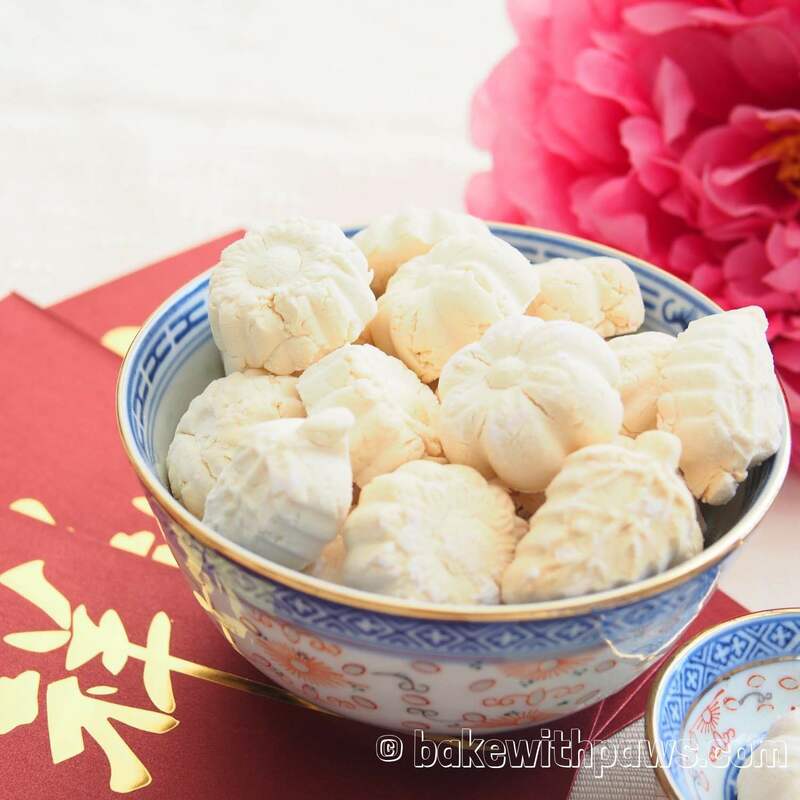 I used to use fresh coconut milk from the first press in the CNY 2014 recipe I shared above. However, the water content in coconut milk can be high and inconsistent. No wonder my late grandmother used to get very frustrated when her Kuih Bangkit did not turn out crumbly even though she used the same method and recipe. 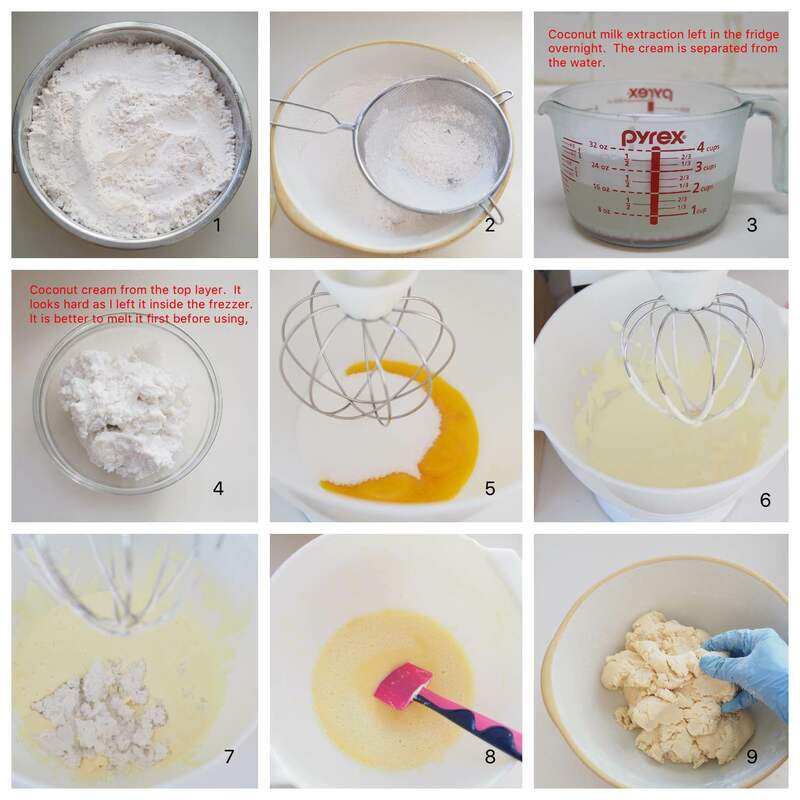 For surer results, I used boxed or canned coconut cream last year. However, the cookies aroma is not as nice as made from fresh coconut. This year I tried again using the coconut cream from fresh coconut after watching MyKitchen101en video on how to extract the coconut cream. I finally succeeded in making this crumbly melt in the mouth Kuih Bangkit in a consistent result. Coconut Cream - Blend grated coconut and hot water in a food processor. Extract the coconut milk in a muslin bag. Transfer the coconut milk in a clear jar and keep in the fridge overnight. The coconut cream will separate from water when chill overnight. Scoop the top layer of coconut cream with a ladle. You will get around 230 to 250g coconut milk. (If you don't use immediately, you may freeze the coconut cream like what I did. Just take out and melt it when about to use). Sift the baked tapioca flour into the mixing bowl. Whisk the egg yolks and sugar until very thick and pale. Stir in 230g - 250g of coconut cream gradually. Gradually add in enough flour, not all and knead to form a smooth soft dough, about 5 minutes. My dough look slightly crumbly because I accidentally added too much flour. You may not use all the flour. Cover mixing bowl with kitchen towel to prevent drying of the dough. Lightly dust a wooden/plastic Kuih Bangkit mould with the remaining flour. 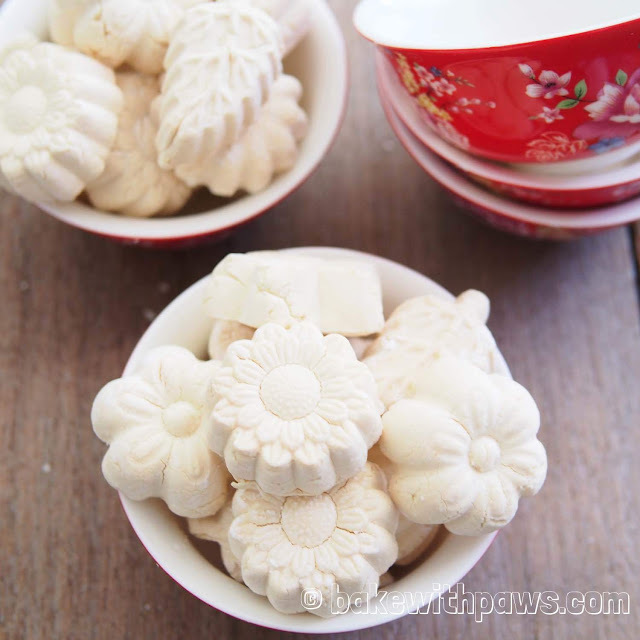 Press a small piece of dough into each on the mould, trim off excess dough with a scrapper and knock the mould gently against the worktop to dislodge the cookies. Arrange the Kuih Bangkit on lined baking trays. Bake at 160C for 10-20 minutes. If a pale white Kuih Bangkit is preferred, remove cookies after 15 minutes. If a more aromatic and crisp cookies is the preference, bake it until just very lightly browned. Cool them and store in air-tight jars. Should knead about 5 minutes. Mine looks crumbly is because I accidentally added too much flour. So, I found a bit hard to knead as my hands are not very strong. I actually used the stand mixer to knead for few minutes until all well mixed. You are right, I remember my granny used to knead the dough with hand.